Dimensions are: 15" x 9" x 4" outside.The BX-18ND Pen Box has two double-wide lift out trays and partitions underneath the lower tray, giving it three levels with 12 pens each. 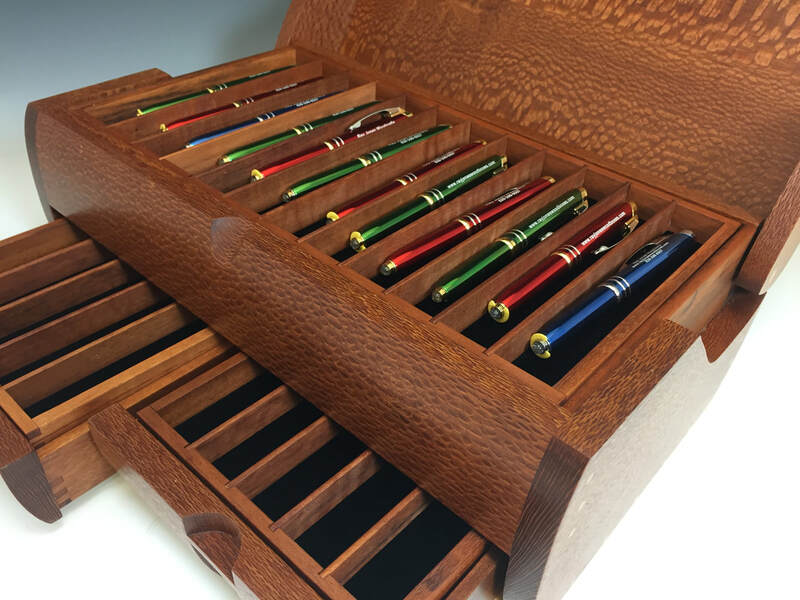 The base price for the BX-18ND Pen Box is $585, some woods will cost more. It is also available empty, or as a jewelry box, watch box, or tea caddy. 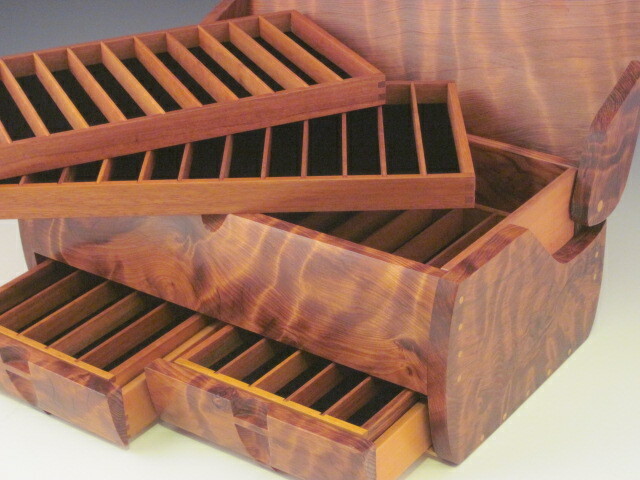 More information about trays and dividers is available here. The BX-18ND box listed below is available, but has not yet been photographed. Please call or email if you would like more information about it. 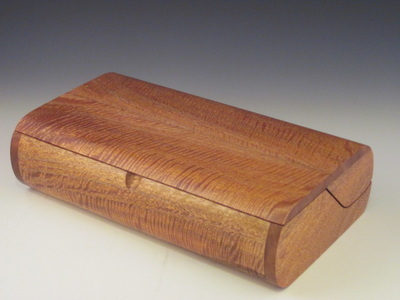 Dimensions are: 12" x 9" x 4" outside.This is a shorter version of the BX-18ND Pen Box . 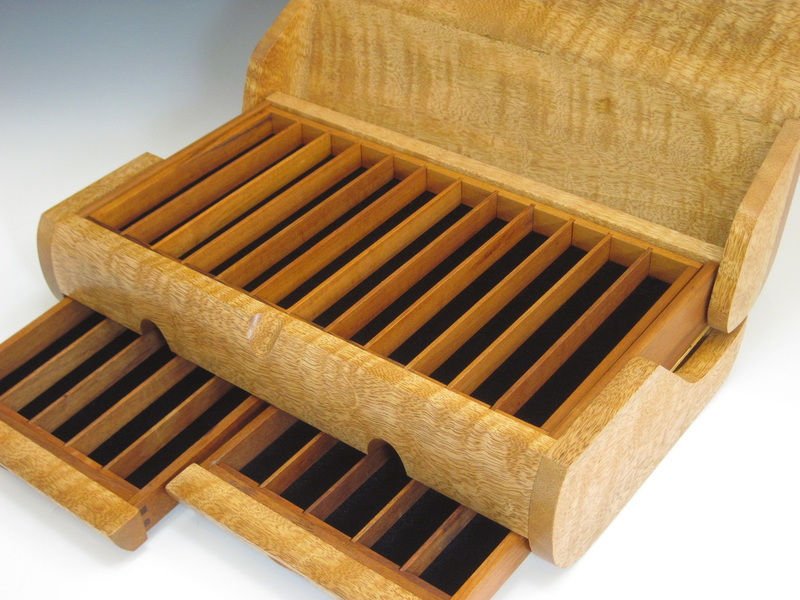 It comes with four, four-pen trays on two levels, with partitions under the lower trays, giving it three levels with 8 pens each. 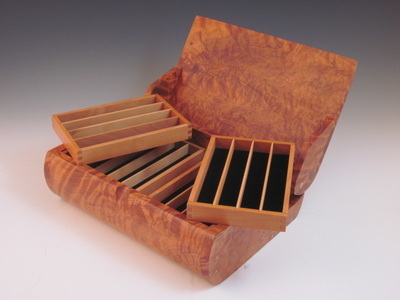 The base price for the BX-18ND Pen Box short version is $495, some woods will cost more. 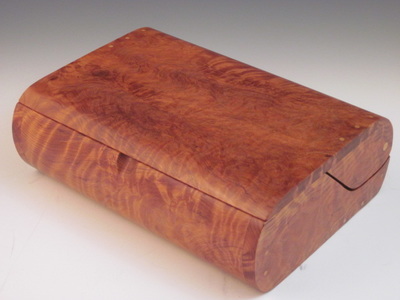 It is also available empty, or as a jewelry box, watch box, or tea caddy. More information about trays and dividers is available here. There are no BX-18nd short version boxes currently available, I will be making more soon. Please call or email me if you would like to have one made to order. Dimensions are:15" x 9" x 4" outside. The main compartment is divided into two levels, with a 12-slot full width tray with 12 slots underneath. There are two drawers, each with five pen slots. 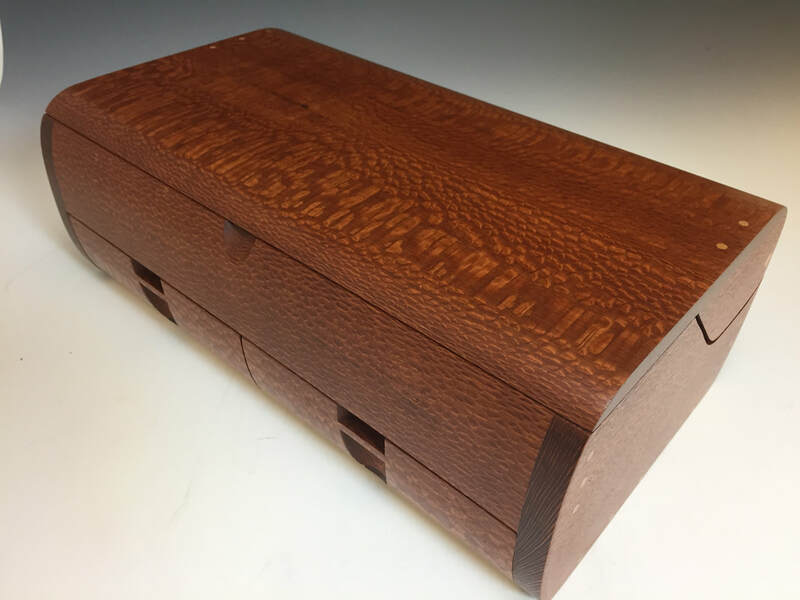 The base price for the BX-18 pen box is $620, some woods will cost more. Additional information about trays and dividers is available here. 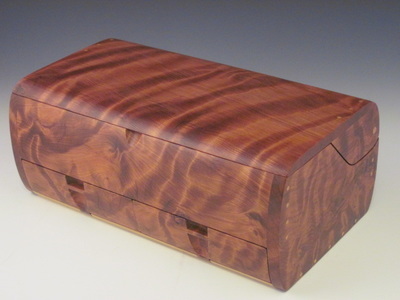 The BX-18 Pen Boxes listed below are also available, but have not yet been photographed. Please call or email if you would like more information about any of them. ﻿﻿Dimensions are: 15" x 9" x 5.5" outside. The main compartment is divided into two levels, with a 12-pen full width tray with 12 more pen slots underneath. There are two drawers, each with a five-pen tray with five more pen slots underneath. 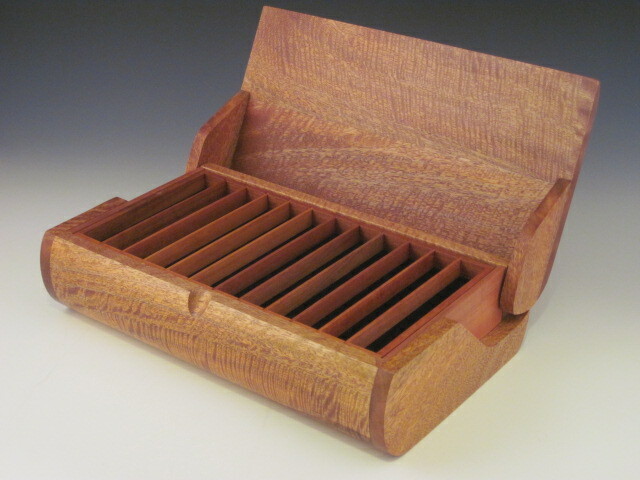 The base price for the BX-19 Pen Box is $775, some woods will cost more. Additional information about trays and dividers is available here. 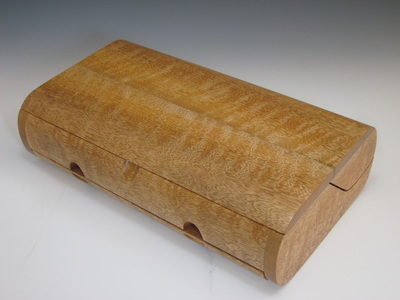 The BX-19 Pen Boxes listed below are also available, but have not yet been photographed. Please call or email if you would like more information about any of them. The BX-20 Pen Boxes listed below are also available, but have not yet been photographed. Please call or email if you would like more information about any of them.